Several recent incidents involving patients receiving burns while in an MRI tube highlight the risk of presuming something can safely be brought near an MRI magnet. Maintaining a safe MR environment takes continual vigilance, noted MRI safety expert Tobias Gilk. 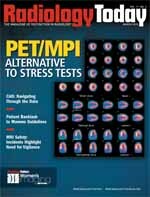 “There is no master list of things not to bring into the MR suite in part because it would take a team of people to develop such a list and tremendous ongoing effort to keep it current,” said Gilk, president and MR safety director for Mednovus, which offers MRI safety products and services, including ferromagnetic detection systems for MRI prescreening. Thanks to the Internet, the story of toddler Noah Crowe quickly caught the attention of the imaging community. When he was a 21-month-old toddler, Noah sustained a third-degree burn on his right arm below his elbow while undergoing an emergency MRI while wrapped in a blanket with a metallic layer to maintain his body heat,.The child had been hospitalized to remove a fist-sized tumor from his brain, according to newspaper reports. Jea R. Gackowski, CHB, CCS, corporate compliance officer for the blanket’s manufacturer, the Encompass Group, said that while “there is really zero evidence that the blanket caused any kind of issue,” the company is voluntarily recalling its product line until a test is developed to verify its safety in the MR suite. In the past, Encompass indicated that Thermoflect products, which are designed to prevent hypothermia in patients, could be used safely in the MR environment. “We at Encompass Group have always been very concerned about patient safety and comfort and so we did this as a precaution,” Gackowski said of the recall. While the Encompass Group isn’t asking its customers to return Thermoflect products, which include blankets, jackets, pants, vests, gowns, caps, and hand and foot warmers, the company is sending out warning labels to be attached to the items in use at various facilities. Additionally, the company is providing placards with the new warning to be hung in MR suites. Gackowski said Thermoflect products, which contain aluminum, had been tested for use in the MRI suite and that no problems had been reported in their 20 years on the market. “We have conducted multiple laboratory and field tests,” she said. Gackowski didn’t know how long it might take for the test to be developed and carried out or for hospitals and imaging facilities to be able to use the Thermoflect products in the MR suite again. Shelly Burgess, an FDA spokeperson, said the Thermoflect products had never been cleared for MR environments and that the FDA is working with the Encompass Group regarding its products and the voluntary recall. According to the FDA’s Office of Device Evaluation, the Thermoflect blanket wasn’t cleared because, as a blanket, it was a 510(k) exempt device, meaning Encompass did not need to seek regulatory clearance prior to marketing it. However, Burgess said, when the FDA learned Encompass was making claims about the blanket being safe in an MR environment, it determined Encompass would need to seek 510(k) clearance. “We received a report of an incident and when we did, we had to follow up on the claim,” Burgess said. That’s when the FDA learned about the MRI safety claim with Thermoflect products. That claim “trips the limits of 510(k) exemption and requires 510(k) clearance,” Burgess explained. Burgess said the FDA’s district office in Atlanta, where Encompass is located, is auditing the product recall’s effectiveness. “The districts determine if all of the firm’s consignees received information relating to the recall and that the firm has effectively communicated the recall issues with the facilities,” she said. Thermoflect is based on technology pioneered by NASA that uses electricity to prevent hypothermia. According to the Thermoflect Web site, the blanket works by preserving—or banking—a patient’s core body temperature. “The innovative Thermoflect material reflects a patient’s endogenous radiant heat, banking it in the body’s core, while preventing convective heat loss (wind chill).” The special silver material is lined with a soft, blue, patient-friendly inner surface,” the company explains. Gackowski said the Thermoflect blanket contains aluminum, but that the metal is trapped between two layers and is vacuumed in. “There is no exposed aluminum,” she said. Gilk said he is surprised the Thermoflect products, which contain aluminized Mylar reflective material, were ever used in the MR suite. Metal poses two distinct risks in the MR environment, Gilk said. The one most people are familiar with is that ferromagnetic material—material that contains iron or nickel or cobalt, for example—becomes magnetic in the presence of another magnetic field. “That’s why things made of iron or steel go flying across the MR suite; they’ve become magnetized and fly toward the MR scanner,” he explained. Gilk noted that the ferromagnetic projectile risk is growing as magnets are made better and stronger. The second though less well-known risk is that metal, even nonferromagnetic types, can become an electrical conductor, and the metal in the blanket may have been positioned in such a way that it became a heat conductor, causing the burn on the boy’s arm. Gilk is confident that had the MR staff known the blanket contained aluminum Mylar on the inside—it is cotton on the outside—they would not have permitted it inside the magnet. “Technologists are very well trained to be watchful for any metallic materials and screen them appropriately before allowing them into the magnet with the patient,” he said. Also recently, Gilk said people have discovered the hard way that the over-the-counter heat wraps used to relieve joint and muscle aches and pains contain iron disks and are not safe in the MR suite. “I suspect the company that makes these wraps had no intention or even contemplated the fact that patients might go for an MR wearing them. But they are pretty significant ferromagnetic material and should never be worn in the MR suite,” Gilk said. He said such incidents continue to put a tremendous burden on MR technologists. “He or she can’t see what the patient may have inside him or her, and now the technologist also has to be concerned about what he or she might not be able to readily see as part of the patient’s clothing or belongings,” he explained. Gilk is hopeful that the warning about Thermoflect product use in the MR will be distributed to the technologists who need to see it. “Hopefully it will pick up permanent residence in the filing cabinet of their brains for all the things they need to be watchful for,” he said. Gilk suspects that Thermoflect products don’t represent a major threat to MR safety. “Hopefully,” he said, “this was just a freak accident.” However, he noted that many times, accidents in the MR environment are dismissed as freak accidents “only to happen elsewhere in someone else’s facility under someone else’s watch.” With today’s communications, though, news of such incidents gets promulgated pretty quickly and widely. “Hopefully, that will help the people in the trenches be more vigilant and certain that it doesn’t recur in their location,” he said.